One bite of this rich, luscious dessert (or breakfast?) is enough to satisfy the sweetest of sweet teeth...and more than one bite may send you over the top. 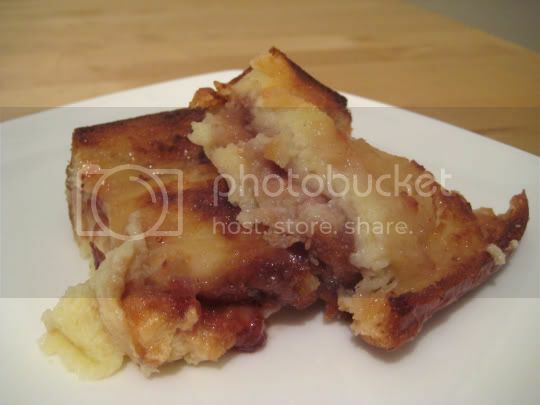 This bread pudding is extremely rich, extremely sweet, extremely buttery, and extremely decadent. Thich, sweet challah bread is soaked in an egg and half-and-half mixture (similar to making French toast, but baked), sweetened with sugar and vanilla. There was a bit too much "eggy" flavor I thought, but nothing an egg substitute couldn't fix (and would also reduce some of the richness). Strawberry jam is spread between the soaked bread layers, and melted butter is brushed over the top of the dish before baking. An entire half-stick of butter is used for this...and trust me, this is a lot. I ended up drizzling the rest of it over the bread because I would have been brushing forever. After baking, a sugar-butter-strawberry jam glaze (yes, more sugar) is drizzled over the top of the pudding, and it is then broiled until a nice carmelized crust appears. The glaze is again too much (and the recipe suggests serving the rest on the side), so I ended up only using half. The extra could be good for muffins though, so keep it if you want...it is addicting. Leftovers were okay for a couple days, but anything after got a little...weird. You'll need something non-sweet to balance out these flavors, so opt for coffee or ice cold milk to enjoy. Make again? Yes, when serving a hungry crowd.